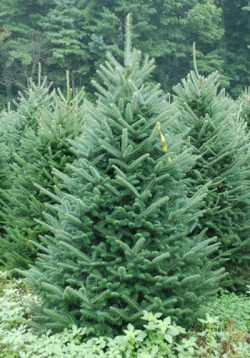 Most Montana holiday trees are Firs, Scotch Pines, junipers, or High Mountain Alpine Firs. Other Non-Native species also find their ways into Big Sky Country. What makes for the BEST holiday tree? Most would agree that shape, color, smell, and price factor in to our choices. Space to hang ornaments and longevity are also important. Eastern Montanans often cut what is available. Much of the habitat contains Junipers or cedars. These durable ad hearty trees can have a decent shape with some trimming. The soft branches do not hold heavy ornaments well. Several Firs are available. Noble, Grand and Fraser are the most common. Their 1-inch needles are soft and well-spaced. The branches allow for plenty of decorations. Heavy ornaments and lights are well supported. They also have a traditional shape and may the best choice for most consumers. They have soft, shiny needles and good shapes. The more tightly bunched branching leaves little room for ornaments. This is the only native Montanan spruce. It drops needles quickly and is best when cut closer to the holidays and well-watered. These high-altitude trees are also known as “Piss Firs”. I have heard three reasons for this. One is that the loggers used them to “piss on” when lumbering. The second is that they smelled like “piss”. The third is the loggers said that they “weren’t worth a piss” as a timber tree. You can choose but these hearty trees have a great and open shape. They are strong and hearty. There is plenty of room for decorations. They are light to carry and haul and in great abundance. A $5 tree permit will pay for this cut your own holiday tree. For more Montana Grant, find him decking his halls at www.montanagrantfishing.com.